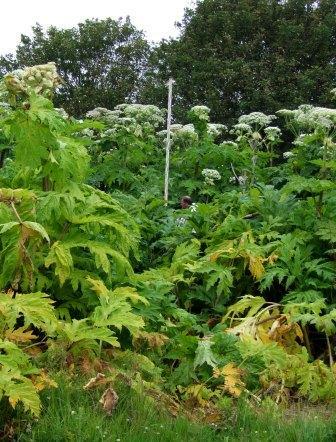 Giant hogweed is developing along the rivers slightly earlier than last year and we estimate the onset of spring is at least 2 week ahead of last year. Plants developing on the lower Ayr that will be sprayed later this month. I checked the worst infested areas on the lower Ayr this morning following last year’s in-house control of key problem locations. Results were encouraging alleviating some of the fears we had about the herbicide’s performance. Glyphosate appears to be doing the job it is supposed to which is a relief and so long as control measures are thorough and comprehensive, then I’m sure we will eventually eradicate this menace plant from our catchments or at least we will have a means to, should adequate funding be available. Control of this heavily infested area last year has been highly effective. 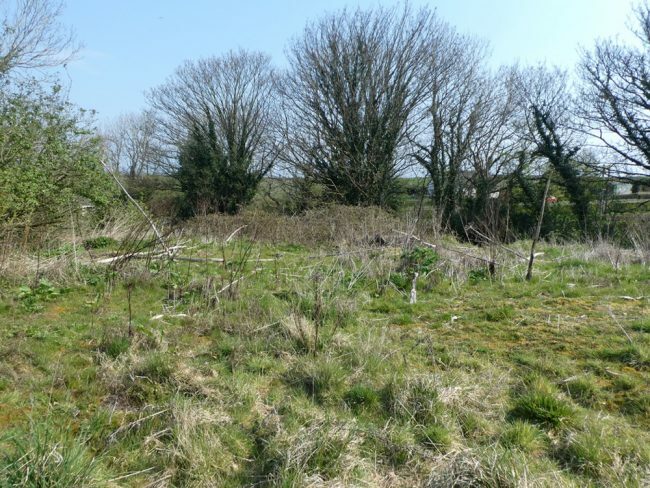 Compare this to the image below of the same site during last year’s control programme. We do have concerns over the plant’s response at times but the end result seems good and a vast improvement of what was there in 2018. 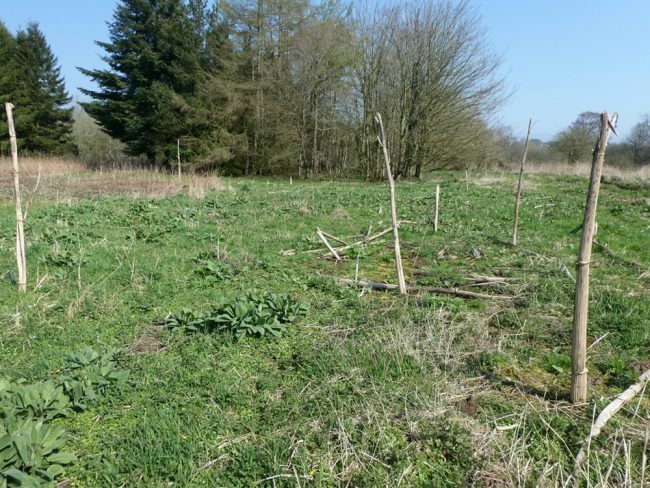 Another plot where we have performed considerable research into the plant’s response to chemical treatments is at Holmston where this site was one of the earliest known severely infested areas in the Ayr catchment. 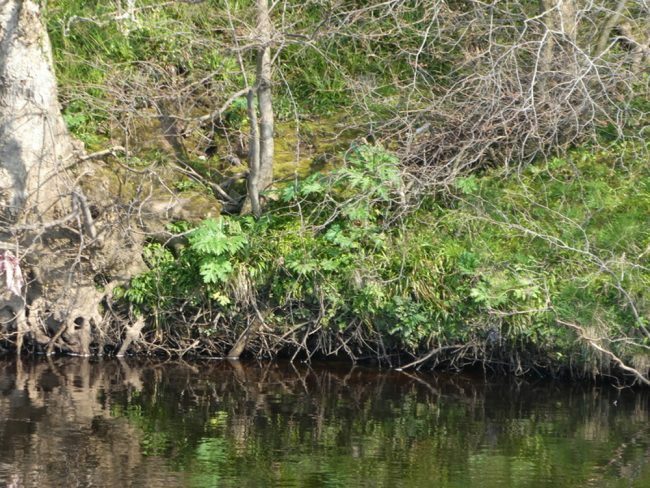 It isn’t linked to the river so isolated and not likely to be reinfested by seed transport. However, it has taken 8 years of herbicide treaments to date to reduce the problem to just a few plants. Control requires considerably less effort than in previous years as we make progress but essentially, this site will still require monitoring and control for several years to come should new plants continue to emerge. 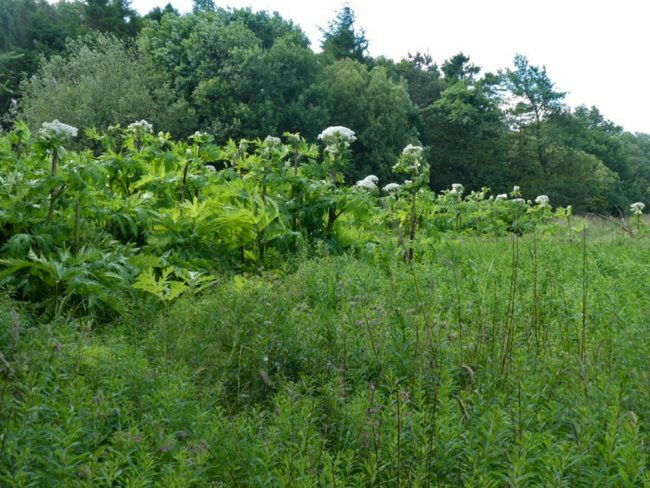 2019 and the Giant hogweed infestation has been substantially reduced from the situation we found when this area first treated in 2011. Compare this and the image below. 2011 and around a week after the first application of herbicide took place. My colleague Brian at that time thought we were wasting our time but results now seem to show that eradication is definitely possible with maintained and effective effort. I expect this site will require further monitoring for years to come but at least we feel we are approaching the goal of eradication. A lack of funding is the single largest threat to eradication closely followed by missing flowering plants. This became obvious last year when funding for control of this species was available only for Ayr and Doon. That lead to the Irvine and Garnock going uncontrolled for the first time in years. That’s a real setback to any attempt at eradication. This year, we have some funding in place for Ayr, Doon and Garnock but as yet not enough and the Irvine is going to have to rely on volunteers that were trained in herbicide application by the Trust previously but that can be haphazard. I spent a lot of time cutting giant hogweed last summer on the river Garnock,from Dalry auctions bridge downstream to estuary,took many hours work over a couple of weeks but had to do something before all the flowers turned to seed,this year is the earliest I’ve seen hogweed growing,the 11th of January ! Great effort Gordon and you will be pleased to know that we have confirmed a budged to train volunteers in herbicide control on the Garnock this year. I think there’s also a budget for green bank engineering in this project and will confirm anything else too asap. Gillian has just secured dates for the training course and haps a poster to circulate this week so anyone interested can get involved. Every small donation helps! Payment by credit/debit card is quick and easy.